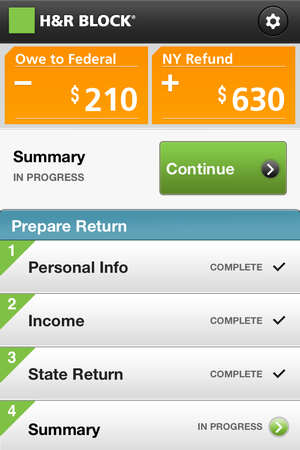 H&R Block At Home 1040EZ is an iOS app designed to file your 1040EZ and its related state form for $10 on your iPhone or iPod touch. To that end, the app runs you through a quick set of qualifying questions to learn whether or not you meet the threshold for filing a 1040EZ and can therefore use the app. Oh So EZ: If your needs are basic, H&R Block 1040EZ can help you have your Federal and State taxes filed in a matter of minutes. 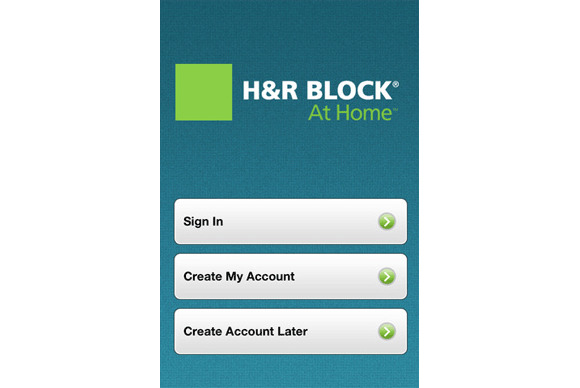 Once it’s determined you can use the app, H&R Block At Home 1040EZ gives you a couple of options for entering your personal information. First, if your employer uses a supported payroll service, you can enter your employer’s Employer Identification Number and your Social Security Number to automatically import your W-2 information. If your employer’s payroll service isn’t supported, you can use the camera on your iOS device camera to take a picture of your W-2 and the app will use OCR on the image and try to add your info automatically. Neither of these options worked for me (My employer doesn’t use a supported payroll service and my W-2 was too wide to take a decent photo) so I had to enter my info manually. But even with manual data entry it took me less than ten minutes to complete the 1040EZ for filing. My biggest gripe with the app is a niggling issue that won’t affect you if you can stay focused for the ten or so minutes required to complete your return. H&R Block At Home 1040EZ offers three options when you first open the app: Sign in to an existing account; Create a new account; Create an account later. If you choose “Create an account later,” and switch out of the app for a few minutes, it does not retain the data you’ve already entered. You have to start from scratch and enter it all again. What’s not to like? If you’re a 1040EZ filer and you’re looking for a quick way to take care of your taxes, H&R Block At Home 1040EZ offers an excellent, free option for filing your taxes and getting your refund in a snap.